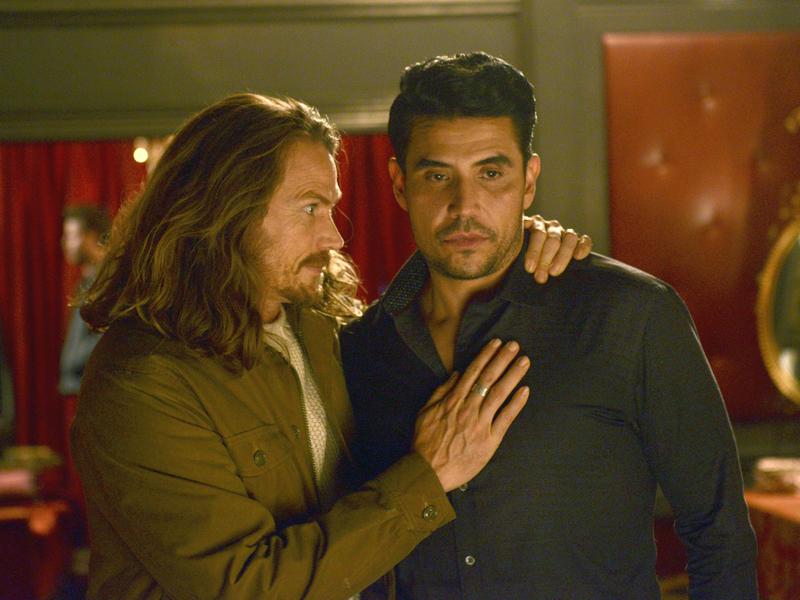 For the past few episodes of Midnight, Texas, half of the show’s Romeo and Romeo storyline has been missing. Why did Bernardo Saracino’s Chuy Strong leave town? And is he a supernatural being? Saracino hails from Atrisco, NM, a small town outside of Albuquerque, where “Midnight, Texas” films. He and I chatted briefly in January while standing in the Home Away restaurant—well, the restaurant set. That’s where I first asked him what secret Chuy keeps in the show’s first season. “Chuy’s very Zen and he meditates a lot and he spends a lot of time focusing on love, focusing on goodness,” he said. “The nature of Chuy’s character is that he’s forced to stay grounded simply by who he is and his past experiences. Joe can lose his cool much more easily than Chuy can. Since that conversation, the writers have dropped more clues about Chuy and about his relationship with Joe, who is played by Jason Lewis. Before Chuy left, he dropped another tantalizing hint when he told Joe he was worried about the tearing of the veil between hell and earth. “What if I can’t fight it?” he asked his hubby. They’re out and proud—as a gay couple. So what is it that Chuy wants to hide about the two of them? “They aren’t a couple that has suited the norm and shouldn’t be together,” Saracino said during a phone call last week. He went on to give a little bit of their millennia-long love affair.